Today marked the final part of the Hōkūleʻa Mālama Honua Celebration with the Completion of the Mahalo Hawaiʻi Sail. Through our partnership with the Ala Wai Watershed Project and the Polynesian Voyaging Society, we were asked to join the crew of the Hōkūleʻa for her homecoming arrival. 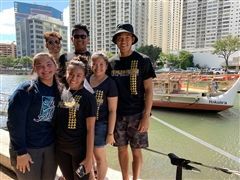 Five of our Hawaiian Studies students, along with their Kumu Kaoi Arakaki-Pedro, were onboard with students from other local schools and organizations that help to preserve the Ala Wai Watershed. 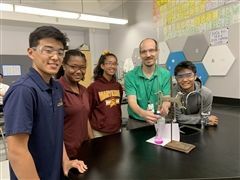 In March Dr. Derek Birkmire '01, our high school AP Chemistry teacher, applied for and received a grant of $500 for science lab equipment. Dr. Birkmire plans to use these funds to purchase the Vernier Labquest 2, a data collection device. The Labquest 2 operates as a digital touch screen and interfaces with over 100 different sensor types, from simple temperature probes to an EKG. 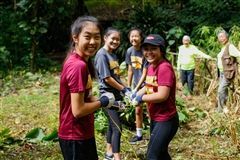 For our school year's final Noblesse Oblige Day of Service, our students spread across the island to serve at various locations and community organizations. Our Class of 2019 seniors also spent the day as a class at their Day of Recollection at the Oahu Veterans Council. 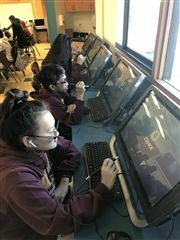 On Thursday, April 4th, our 8th Graders explored our ZSpace 3D computers as a part of their Project Lead the Way (PLTW) Curriculum. Their current project calls for learning how to use the ZSpace computers, exploring the anatomy software, dissecting a pickle, dissecting a ZSpace brain and finally culminating in a real Project Lead the Way sheep brain dissection. 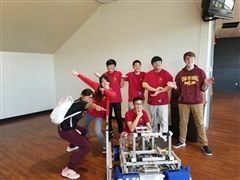 On Saturday, March 30th, our high school FIRST Robotics Team qualified for the FIRST Robotics National Championship Competition in Houston, TX. The regional qualifying tournament consisted of 34 teams from schools around the state and several international teams from Asia. Earlier this month, we were thrilled to welcome back Dr. Darlene Ramones, M.D., a proud Class of 2000 alumna and our very first Kekumano Scholarship Recipient. Dr. Ramones spoke with our AP Biology, Human Anatomy and Physiology and Intro to Health Professions students about the path she took to medical school and provided helpful insights for those looking into entering health care professions. Bold, Brave, Spartan alum MJ Mao '17 will be participating in the 2019 NCAA Division I Men's Swimming National Championships in Austin, TX this weekend! 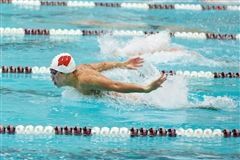 MJ, a member of the Big Ten University of Wisconsin Swim team, qualified for the national championship meet after breaking two school records in the Big Ten Championships in February - with a 100-yard Breaststroke time of 52.28 and 200-yard Breaststroke time of 1:52:40. His 200-yard Breaststroke time is also a record time for a Hawaii scholar-athlete and was an automatic qualifying time for the NCAA Championship! Adult Activity Card - Must present the ILH Adult Activity Card with the cardholders name on it and show their drivers license/ID Card. This pass is embossed with the ILH logo. Only if the varsity team is scheduled to play on that date at admission site for free access. Student I.D. Card - Must present a current school year Student I.D. Card with a student photo and name of school. Presentation on a smart device or printed paper copy shall not be accepted. Only if the varsity team is scheduled to play on that date at admission site for free access. On Saturday, March 16th, Maryknoll students, families and staff members volunteered and participated in the first ever Keiki Rainbow Run, hosted by the Blue Zones Project Hawaii. In total, over 2,000 keiki and family members came out for this 1.2-mile fun-run around the University of Hawaii at Manoa’s Clarence T.C. Ching Field. 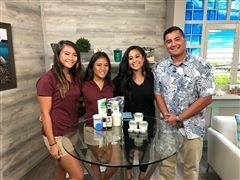 For every keiki registration, $15 was donated to their school for P.E. and nutrition programs (and 100% of early bird keiki registration fees went directly to the registrant's school). 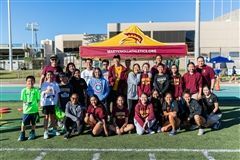 The event's participants collectively raised over $20,000 for physical education and nutrition programs in Oahu schools. Pi Day was celebrated at Maryknoll today! On Thursday, March 14, we celebrated Pi Day at Maryknoll! Our biggest activity was a week-long auction for students to vie for the winning bid to pie one of 25 teachers who volunteered. Proceeds from the auction were raised for the Leukemia and Lymphoma Society. More than $1,200 was raised for research and treatment of blood cancers, an ailment that also affects loved ones of our Maryknoll Community. Each teacher was pied by their winning bidders, to the delight of all who watched and cream and crust flew through the air! 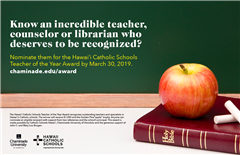 Chaminade University and Hawaii Catholic Schools are pleased to announce that nominations are currently being accepted for the 2018-19 Hawaii Catholic Schools Teacher of the Year. This award recognizes excellence in teaching within the Catholic Schools in the State of Hawaii. For 2018-19, the recipient of the award will receive the Pine “apple" trophy and a check for $1,000. On Monday, March 11th, our Spartan Jazz Band was treated to a special masterclass visit from jazz musician Dean Taba. Mr. Taba is among the greatest jazz musicians on Oahu, and has made his mark as one of the premier bassists on the island. Mr. Taba also serves as the director of the Hawaii Youth Symphony Combo and the Jazz Band of The University of Hawaii at Manoa. 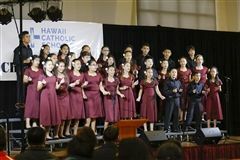 On Thursday, March 7th, Maryknoll School hosted the 7th Annual Hawaii Catholic Schools (HCS) Choral Festival at the Maryknoll Community Center. The singing celebration featured meticulously-crafted performances by choirs representing a record 15 Catholic schools across the island. This year's theme was "An Attitude of Gratitude". Congrats to our Middle School Choir for a job well done representing our school at this year's choral festival! 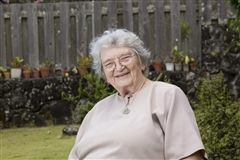 Sister Joan Chatfield, M.M., Ph.D., was a Maryknoll Sister for 68 years and one of the great examples of Christ’s love in our community. She died peacefully Friday, March 1, 2019. Maryknoll School invites all lifelong learners to experience an unforgettable summer. Your child can explore their interests and accelerate their academics through a variety of our K-12 programs. With programs from Chinese Immersion and basketball to app building and art, your child’s summer is sure to be memorable. The Japan-America Society of Hawaii - Japan Wizards Statewide Academic Team Competition (JWC) was held this past Saturday at Tokai University in Kapolei. Out of the 42 teams that entered the competition, our Advanced Team B took 3rd place! 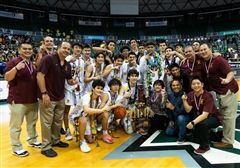 Our Bold, Brave, Spartans clinched Maryknoll’s first Boys Basketball Division I state title in over 34 years with their thrilling 50-34 win over defending state champion Punahou! Our boys would like to extend their thanks and mahalo to all of the Spartan fans, supporters, family, friends, faculty, staff, alumni, and coaches that cheered them on and supported them all season! Way to go boys on a hard-fought season and congrats on this special win! Our Bold, Brave, Spartans advance to the HHSAA Division I State Championship Game after their 47-29 semifinal win over Kailua High School. Our Spartans will take on Punahou tonight (Saturday 2/23) at 7:00PM at the Stan Sheriff Center for the 2019 state championship title. The game will also be broadcast live on Spectrum OC16! Be sure to come out and cheer on our Spartans as they seek their first Division I state championship since 1984! Cheer On Our Boys Basketball Team in the State Semifinals Tonight! Cheer on our Boys Basketball Team tonight at 7:00PM at the Stan Sheriff Center, where they'll take on Kailua High School in the semifinal round of the HHSAA State Basketball Tournament! The game will also be broadcast live tonight on Spectrum OC16! Be sure to come out, wear your maroon and gold, and cheer on our Spartans! Cheer On Our Boys Basketball Team and Wrestlers at States This Week! Best of luck to our Boys Varsity Basketball Team and Maryknoll/PAC-5 Wrestlers and as they participate in their respective HHSAA State Tournaments this week! Be sure to come out and support our Bold, Brave, Spartans! 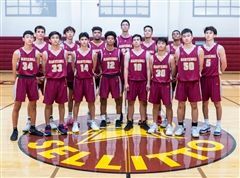 Congratulations to our Boys Varsity Basketball Team on clinching the 2019 ILH Division I Championship with their 55-42 win over #2 ranked Punahou on Monday, February 12th at the Maryknoll Community Center! These Bold, Brave Spartans have also earned a seeded berth and first-round bye in the HHSAA State Basketball Tournament next week! Way to go Spartans! 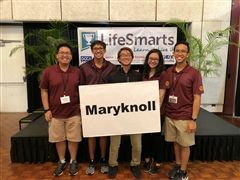 Maryknoll Team Takes 2nd Place in State LifeSmarts Competition! Congrats to our LifeSmarts Team! On Saturday, February 9th, our LifeSmarts team (one of four schools to compete at the state level) took 2nd place overall! Maryknoll qualified for Hawaii LifeSmarts state competition by placing in the top four in the online competition in December. The other three teams in the top 4 were Punahou School, Iolani School, and Waipahu High School. We're excited to share that our Chinese Immersion Program — the only school-day Mandarin immersion program in Hawaii — will be expanding through the sixth grade over the next five years. Through a generous $225,000 donation from local philanthropist and Maryknoll alumnus Douglas "Doug" Ho '60, we will further develop the Chinese/English curriculum for grades 2-6, provide even more faculty development, and enhanced learning tools for the program over the next five years. Each year, Hawaii Catholic Schools hosts the Annual Conference For Catholic School Educators during Catholic Schools Week. During this professional development conference, faculty and staff celebrating work anniversary milestones are also recognized for their service to Hawaii Catholic Schools. This year, we celebrated seven Maryknoll faculty and staff members for their service to our school. 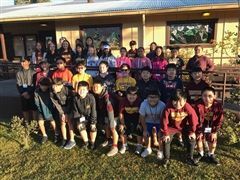 Each year, our 6th grade class travels to Hawaii Island (the Big Island) as a way of experiencing Hawaiian culture, values, and history, while making integrated connections with different subject areas, with a special emphasis on science and social studies. They arrived in Kona on Wednesday, January 23rd and returned to Oahu on Friday, January 25th. Homecoming Game Day 2019 is Here! We hope to see you all there, cheering on our #BoldBraveSpartans in your Maroon and Gold! 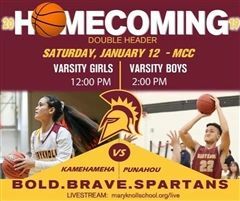 You can also catch all the action streaming live online at maryknollschool.org/live! Let’s go Spartans!!! Four select groups will also be presenting in the Learning Commons. Their presentations will be streamed live online at maryknollschool.org/live. Please know that we are sensitive to the challenges you and your families are facing as you consider schools in the near future. In light of this unfortunate situation, we are doing what we can for those families who are considering continuing their child’s Catholic education at Maryknoll School. Maryknoll provides a nurturing, caring and tight-knit community, and shares many of the same values that you’ve become accustomed to at Saint Francis. To help navigate the admission process, we have developed a streamlined admission information sheet for you and your families. Click here to review our Admission Information Sheet for Saint Francis families interested in applying to Maryknoll School. Should you have any questions, please contact our Admission Office at 808-952-7330 or email admission@maryknollschool.org.